Western blot analysis of extracts from various cell lines, untreated (-) or treated with Human Platelet-Derived Growth Factor AA (hPDGF-AA) #8913 (100 ng/ml, 15 min; +), using Phospho-Akt (Ser473) (D9W9U) Mouse mAb (upper), Phospho-Akt (Ser473) (D9E) XP® Rabbit mAb #4060 (middle), and Akt (pan) (40D4) Mouse mAb #2920 (lower). 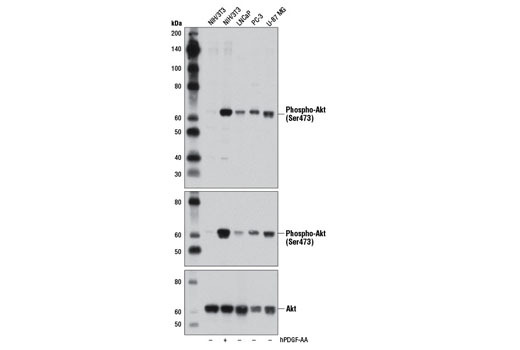 Western blot analysis of purified recombinant phospho-Akt1 (lane 1), phospho-Akt2 (lane 2), and phospho-Akt3 (lane 3) proteins using Phospho-Akt (Ser473) (D9W9U) Mouse mAb. 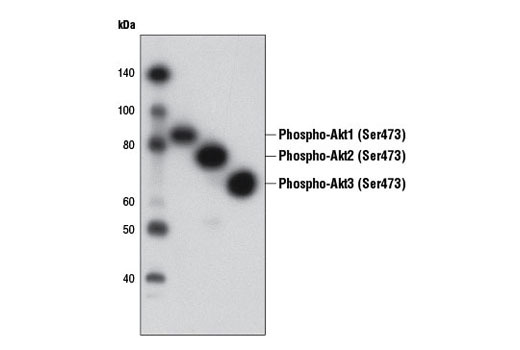 Phospho-Akt (Ser473) (D9W9U) Mouse mAb detects endogenous levels of Akt1 only when phosphorylated at Ser473, Akt2 only when phosphorylated at Ser474 and Akt3 only when phosphorylated at Ser473.